Good News for candidates who want Join Indian Army. 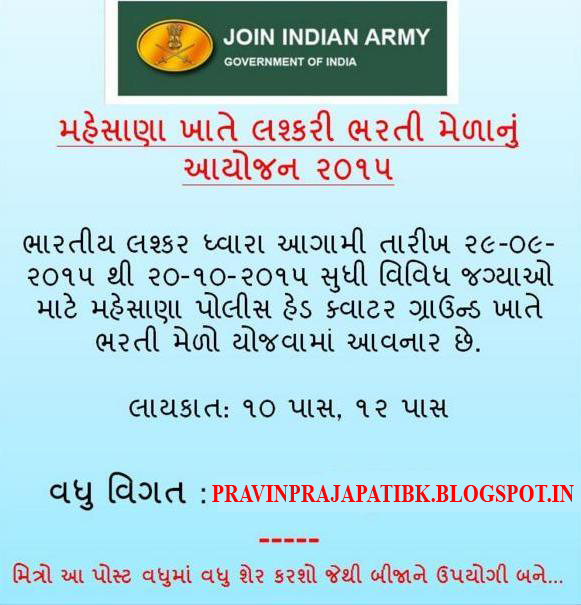 Indian Army Government of India is going to conduct Indian Army Recruitment Rally at Mahesana. Mahesana Bharti Melo 2015 for various posts like General Duty, Soldier General Duty (Tribal), Soldier Technical, Soldier Clerk, Soldier Tradesman etc. Mahesana Army Bharti Melo will be started form 29-09-2015 to 20-10-2015. 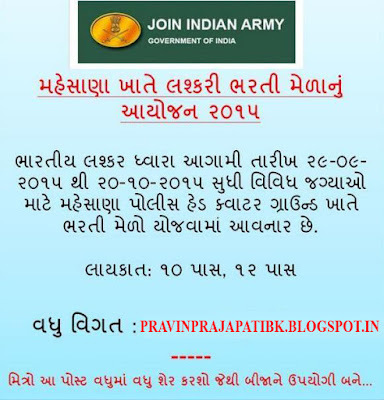 Indian Army has published notification for recruitment of various post in Army. Indian Army will be held Open Bharti Melo at Mahesana. The official notification of Gujarat Lashkari Bharti has published in various news paper and Rojgar Samachar dates 16-09-2015.